Wealthy families in the 17th century frequently commissioned paintings to commemorate the courage or nobility of an ancestor. This one is unusual as it shows the actual feat of strength and includes a poem describing it. 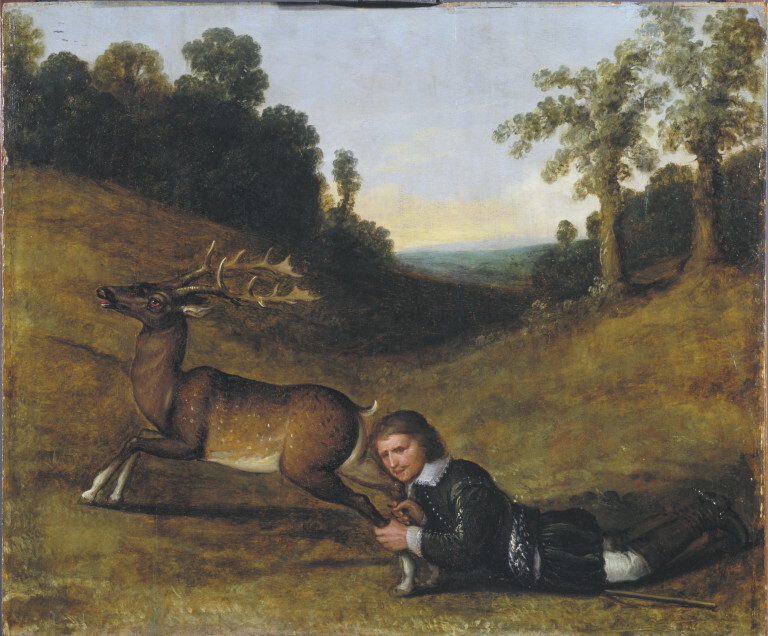 The painting was made to celebrate the bravery of Colonel Sir William Smith, who inherited Hill Hall in Essex in about 1577. The humorous Latin poem was by his friend and neighbour Sir Robert Wroth of Loughton Hall (three miles from Hill Hall). The original painting was probably lost in the Civil War of 1642-1646, when Hill Hall was looted, but the Smith family may have had this painting made to replace it. The Colonel is shown in 17th-century costume, of the period in which the replica was made. 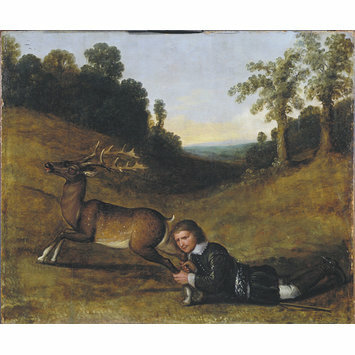 According to the poem, a stag had broken into Colonel Smith's fenced garden, and started to crop the plants. The Colonel turned out his hounds, but the stag ran off into the wild. Suddenly it fell into a stag pit, and in pursuing it the Colonel fell in as well. He grappled with the animal as it tried to escape, dragging him along, and finally he overpowered it. He then tied its feet together with one of his garters.